A native of Belpre Ohio, John enlisted in the United States Navy after graduation from High School during the Vietnam Era. After serving in the military, John attended the Cincinnati College of Mortuary Science and the University of Cincinnati, where he received his Mortuary Diploma in 1975. After serving his apprenticeship, he was employed as a licensed Funeral Director and licensed Embalmer in Bristol, Rhode Island. Before moving to Alliance, he was also employed at the Gerner and Wolf Funeral Home in Port Clinton, Ohio. John currently serves on the Board of the Alliance Area Development, Men's Challenge, Alliance YMCA and Ohio Funeral Directors Association. He is a past President of the Alliance Chamber of Commerce, a member of Conrad Masonic Lodge #271 F&AM, a 32nd Degree Mason as well a member of The Tadmor Temple and Alliance Shrine Club. John is a member of Christ United Methodist Church. He resides in Alliance and has two children, Adam (Bethany) Christian and Ashley (Jed) Gronewald, and six grandchildren. Nancy was born and raised in Alliance. A 2006 honors graduate of Mt. Union College, Nancy became a licensed funeral director in 2008, and earned the title of CFSP, Certified Funeral Service Provider through the Academy of Funeral Service in 2015. In 2016, Nancy became a Certified Funeral Celebrant, to offer another choice for the families we serve. She is involved with many community organizations, including the Alliance YMCA, where she is a member of the board, and served on the Annual Strong Kids Campaign. She is an active member of the Alliance YWCA, past board president, chairman of the Mardi Gras Celebration, and 2014 recipient of the Fulmer Volunteer Leadership Award. Nancy is also a member of the Alliance Kiwanis Club, the Alliance Woman's Club, Coterie and the Alliance Area Chamber of Commerce, Women's Division, where she serves as the chair of Civic Affairs. In May 2017 Nancy received the Athena Leadership Award at the Annual Chamber of Commerce Dinner. She attends Christ United Methodist Church, and has two sons Matthew and Russell. A native of Alliance, Josh is a 1999 graduate of Bowling Green State University and a 2000 graduate of the Pittsburgh Institute of Mortuary Science. A veteran of the U.S. Army, Josh returned to Alliance in 2010 to join the family here at Cassaday-Turkle-Christian Funeral Home as a Licensed Funeral Director / Embalmer and a Certified Crematory Operator. Josh is a member of the Alliance Rotary Club, the Alliance Salvation Army Advisory Board, Greater Alliance Carnation Festival Board, the American Legion Post 166 and the VFW. He enjoys running, hiking and camping. A native of Alliance, Adam graduated from Marlington High School in 2000. He received a Bachelor’s degree in Business Administration from Northeastern University in Boston, Mass. He previously worked for companies PriceWaterhouseCoopers and State Street Bank as a corporate auditor. 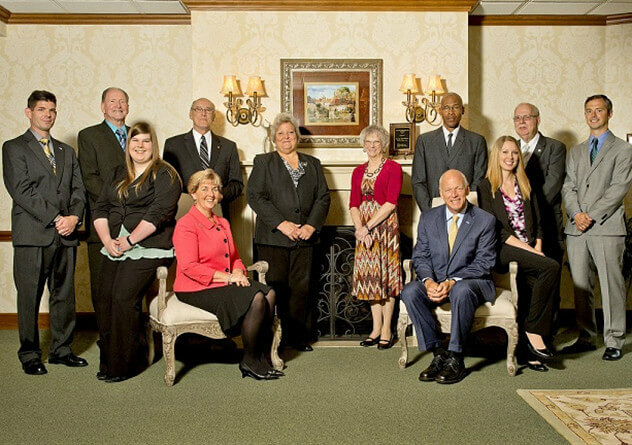 Adam returned to Alliance in 2017 to join the family here at Cassaday-Turkle-Christian Funeral Home. He is a Certified Crematory Operator and in the process of becoming a Licensed Funeral Director. Currently Adam serves on the Board of the Alliance Chamber of Commerce and the Stuckey Interfaith Child Development Center. He is also a member at the Alliance Friends Church and part of the Filibusters social group. Adam and his wife Bethany have four girls and reside in Alliance. Cassidy was born and raised in Youngstown, Ohio and is a graduate of Youngstown Chaney High School. She obtained her life and health insurance licenses and also completed training in Advance Funeral Planning through Precoa. She is a member of the Alliance Area Chamber of Commerce Women’s Division. Cassidy resides in Sebring with her husband, Adam and enjoys spending time with her family, dog and cat. Debbie was born and raised in the Alliance area. She is a graduate of Marlington High School and was formerly employed in Hartville for 30 years. In 2007, she was honored to join the funeral home as the office manager. She is a member of the Alliance Area Chamber of Commerce, Women's Division and Alliance Area Office Professionals. Debbie lives on the outskirts of Alliance and is a very family-oriented person who enjoys walking, biking and vacationing at the beach. Elizabeth manages the accounts receivable at the funeral home in addition to helping our family's process life insurance. A graduate of West Branch High School, Liz resides in Sebring with her husband, Steve, and step-daughters, Mikah and Paige. She attends Truth Baptist Church and enjoys spending time with her family and puppy, Elvis! Joyce joined our staff in 2009 with many years of accounting experience which is now being applied to the funeral industry. She is a native of Salineville, Ohio and resides at Westville Lake in Beloit. Joyce is a member of the Alliance Area Chamber of Commerce, Women's Division where she previously served as Treasurer and Secretary. Brandon was born, raised and currently resides in Alliance. A 2017 graduate of Kent State University, he received his Bachelor of Arts in Psychology with a minor in Marketing. A 2018 graduate of the Pittsburgh Institute of Mortuary Science, Brandon is a Certified Crematory Operator and Certified Dual Licensed Funeral Director and Embalmer Apprentice. Joel is a lifelong resident of Alliance, a 1964 graduate of Alliance High School, and also attended Stark Technical College. He is married to his wife Cathy of 49 years and they have two children, Stephen and Angela; and granddaughter, Whitney. Joel retired with more than 27 years of service in the Army and also from Hoover Co. in Canton. He is a member of Abiding Saviour Lutheran Church, Masonic Bodies Conrad Lodge No 271, F & AM with more than 50 years, the York Rite Bodies of Canton, the Tadmor Shrine of Akron, American Legion Post 166, VFW Post 1036 and VVA Chapter 157. He has also been a Commissioner for Stark County Veterans Service for more than 15 years. Jay Sweitzer was born in Marlboro Township and a graduate of the former Marlboro High School. He currently resides in Alliance with his wife, Joann. Jay served with the United States Army Reserves for six years. He was employed at Edwards Pontiac in Canton for 20 years and farmed in Marlboro Township for 20 years. Jay retired from Marlington Schools in 2003 and has been with us at the funeral home for 20 years. A graduate of Alliance High School, Marc was born in Canton and raised in Alliance and has two sons, Marques and Anthony. He was a 1982 graduate of Baldwin Wallace where he received a Bachelor of Arts and Science degree in Political Science and Criminal Justice with a minor degree in Special Education. He taught for 30 years with the Stark County Board of Developmental Disabilities and is currently an assistant varsity football coach at Marlington High School. A certified personal trainer and strength training coach, Marc teaches strength, circuit and Silver Sneaker classes at Meyers Lake YMCA in Canton and also does home personal training. He attends Damascus Friends Church and is a member of the Stark County Coaches Association.